Summer opens up a whole new range of activities. Take advantage and make some great memories with your little one! 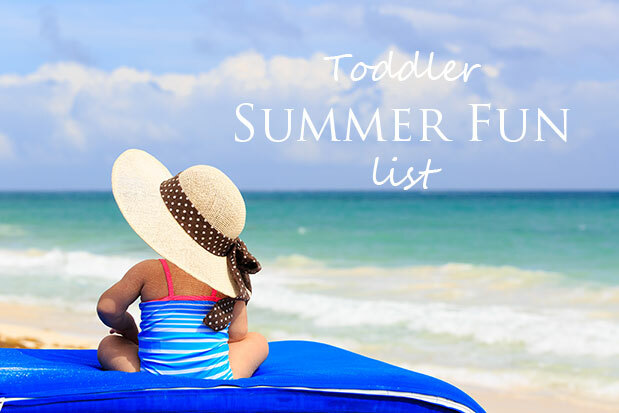 Here’s a list of summer fun activities to enjoy together. Play with bubbles: It’s oh so fun to chase and pop bubbles! You can even make your own bubble solution. Go to the zoo: Splurge on a stuffed animal from the souvenir shop. Make a water blob: These look so fun and cool on a hot summer day! Play with buckets of water and measuring cups: You don’t have to get too fancy to entertain a toddler. Get out your big bowl and let them dump away. Make a splash pad: Set up a few sprinklers on some plastic for a refreshing summer activity. Go to story time: Many libraries offer a free story time program. It’s a great opportunity to teach your toddler about sitting still and making new friends. Fly kites: A classic summer fun activity. Dig for dinosaur bones in the backyard: Plant some fossils for your little to find. Go to the park: You could bring a friend, or make it a mommy date! Play with shaving cream: Put food coloring in it, and now you can paint the sidewalk! Pick flowers: Put them in a pretty vase on your table. Go to a petting zoo: You know your littles would love this! Play in the sand: Build a sand castle. Knock it down. Little ones love the new sensory feeling of sand. Make mud pies: Just once! Go to a beach: Play in the sand and splash in the water together! Draw with sidewalk chalk: A fun and simple activity for your toddler. Wash the car: Your little one will love sponging and hosing mommy’s car! Go swimming: Check out the local pool for a day. Eat a popsicle: Indulge in a cool mid-day snack. Plant something: Visit it every day to take care of it and watch it grow. Go park hopping: Have a whole afternoon to kill? Explore some new parks in your area. You may even find a new favorite. Eat ice cream: What’s summer without a little ice cream? Make it even better by getting it from the big pink ice cream truck! Run in the sprinklers: So fun! Play ring around the rosie: Guarantee your littles will love this! Watch fireworks: Snuggle up together for the show. Wash their ‘car’: Shine up their little trike or cozy coupe! They’ll feel so proud and important. Eat snow cones: Head to the local snow shack for a refreshing summer treat. Chip away at frozen ice blocks: Freeze some little treasures in a big block of ice and let your little one dig them out.